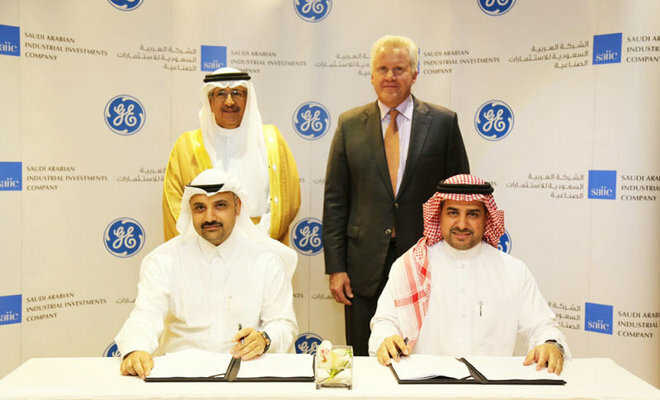 Jeddah, Saudi Arabia; May 23, 2016: DUSSUR and GE (NYSE: GE) have signed a Memorandum of Understanding (MoU) to co-invest in strategic sectors that will help develop and localize industrial value chains in Saudi Arabia to serve the domestic market and beyond. Joint investments of US$1 billion (SAR3.75 billion), will be rolled out by 2017, in addition to an aggregate potential investment of US$2 billion (SAR7.5 billion) to drive projects in water, energy, aviation, digital and other sectors from 2017. Complementing the goals of Saudi Vision 2030, the overarching aim of the agreement is to establish transformative projects that will promote industrial diversification, deepen manufacturing capabilities in the Kingdom, build industrial know-how and create quality jobs for Saudi nationals. This will be through joint ventures in advanced manufacturing facilities in the Kingdom as well as by developing emerging digital and other industrial technological capabilities in Saudi Arabia. DUSSUR and GE will also co-develop wide-ranging digital industrial applications and solutions that aim to foster home-grown digital innovation. The software solutions will cover data visualization, big data management, and data analytics, among others. A joint venture of Saudi Arabian Public Investment Fund (PIF), Saudi Aramco and Saudi Arabia Basic Industries Corporation (SABIC), DUSSUR has the mandate to investing in and developing globally competitive industrial sectors in the Kingdom. It focuses on driving inward investments to the Kingdom through joint ventures and partnerships with global industry leaders. Follow us on our social media channels. Simply click on a link below.